I wanted to share some thoughts about what a Home Funeral is, and how we can help you if you decide to keep your loved one at home after they have died. I recently attended a training course, run by the lovely Claire Turnham of Only With Love, on caring for the deceased at home. 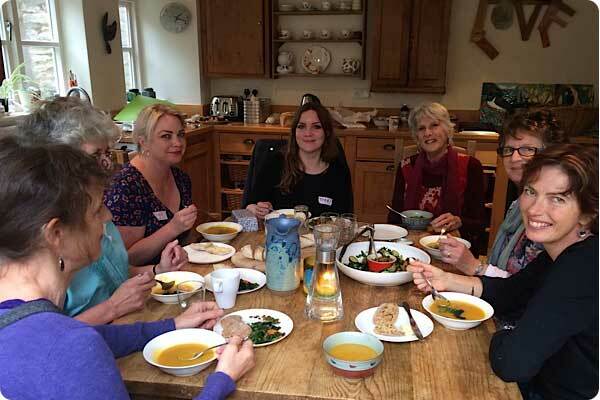 The training combined the very practical aspects of caring for a body at home along with an exploration of the emotional and spiritual benefits it could bring. Claire had arranged for Jerrigrace Lyons, founder of Final Passages, and her partner Mark, to come over from California to share their experiences and practical knowledge. Jerrigrace has helped over 300 families to have a home funeral in the US and Claire is working to establish a Home Funeral Network in the UK. I am excited and delighted by this. Home funerals are not necessarily right for all families and situations, but such a network fits perfectly with mine and Fran’s beliefs at A Natural Undertaking, that if people can access information and practical help they can make more informed and often, better, decisions. So what does a home funeral mean? A traditional home funeral usually means that the family care for the body at their home for a period of time before the burial or cremation. It’s totally family-led. Many people who’ve chosen a home funeral believe that it provides both a healing experience and a sense of control over a situation which has essentially been thrust upon them; this in turn helps them to come to terms with their grief. It can encompass all aspects of arranging the funeral- from care of the body to transport, paperwork, arranging the service and making or purchasing a coffin. It’s a backwards step in many ways. After all, we have been looking after our dead at home forever. It’s only in the post-war period that we have become used to the funeral director looking after the body immediately after death and up until the funeral. Of course many cultures still observe home funeral traditions in the UK, but many of us will have experienced the now usual “disappearance” of the dead to a funeral home somewhere outside of our control and influence. In the past keeping the body at home meant that key rituals or ceremonies could be undertaken by the family and friends; washing and dressing the body, and the laying in honour, are often an important part of the grieving process. Who can do home funerals? With some practical advice anyone can understand how to keep a body at home for a number of days. But it’s not for everyone and in some instances a home funeral just may not be possible. If the person who died had expressed a home funeral wish, then simply knowing their wishes can make it easier, but it may require a bigger support network of friends and family than is available. Ultimately the choice is yours and taking action is easy. If you want to discuss any fears or concerns, do get in touch and we can talk you through your options. My own feeling is that the more information there is out there on when and how home funerals can be practically achieved, the more we can help people make a decision that is right and natural for them. I felt uplifted and genuinely empowered by the home funeral training. I was not only surrounded by a group of genuinely caring and fun individuals, but was also moved by the conversation and insights shared that day. It makes complete sense: if people know what they CAN do, that has to be a positive thing. The Natural Death Handbook is a must read.